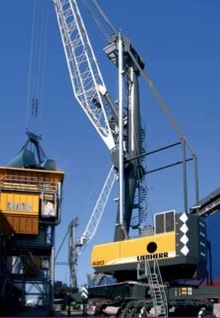 Australian-based Northern Stevedoring Services (NSS) has placed an order for a Liebherr mobile harbour crane, type LHM 420, to operate on Berth 3 and 4 in the Port of Townsville, Queensland. The operations of the stevedoring company span all of regional Queensland’s major port facilities, providing the full range of stevedoring and logistics solutions. The new crane is the third LHM crane for NSS, which has been operating an LHM 550 and an LHM 1300. The crane comes with double supporting pads and software to assist in meeting the quay limitations, along with Liebherr’s Cycoptronic anti-sway system and a twinlift spreader. The LHM 420 is also fitted to operate with the Rotabox system for dust-free high-value mineral handling. This brings Liebherr Maritime Cranes’ mobile harbour crane tally for Australia up to 10 in the last 18 months, with two for Fremantle, one for Bunbury, Geraldton, Port Hedland and Darwin, three for Henderson and now one for Townsville.